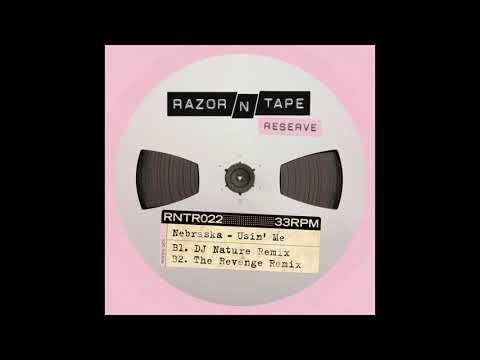 Brooklyn based label, Razor-N-Tape, has been pumping out delicious selections of contemporary house music since 2012. They’re back to tease our end of summertime sadness with one last block party banger. However, this time around they have relied on beats from across the pond – London-based producer Alistair Gibbs, better known as Nebraska, to be exact. Like many of our favorite house artists, Nebraska comes from the golden age of sample-based hip hop, making him well-suited for utilizing soulful excerpts in developing his funk-filled discography. The latest addition in his long list of tracks that stretch back to the early 90s is an original titled Usin’ Me, which features remixes from the likes of Lovebirds, The Revenge, and someone who we are lucky to feature below. Harlem native, DJ Nature hops on a remix of Nebraska’s “Usin’ Me” to remind us that summer’s never over. Traveling through a smoldering baseline, DJ Nature goes deep into the jungle. His slowed down percussion rework vibrates with chimes, shimmering snares, and rattling hats that gleam through the heavy atmosphere of the track. Throughout the track, shakers become the rattling of snakes and borrowed squelches start to sound like bird calls over this airy, bongo groove. Whether you’re in the forest or on your walk to the train, DJ Nature is sure to ease you gently into the approaching chill. Make sure to get yourself a copy by pre-ordering the EP here.